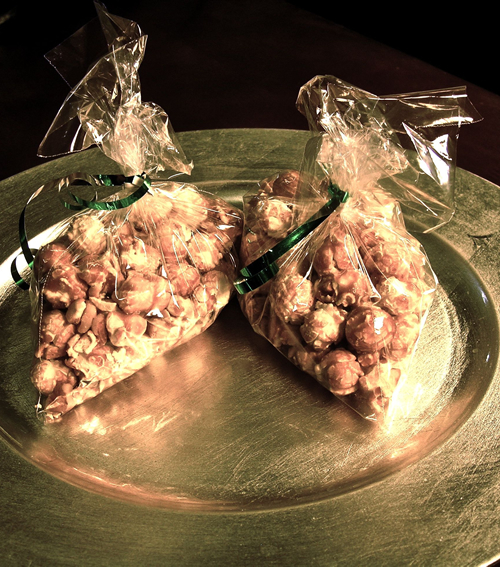 Popcorn drenched in toffee is a butter lover's delight. It's crunchy, sticky, sweet and salty and rolled up into one scrumptious snack. A great, easy to make, addictive snack. In 1947, Toys for Tots organized its first Christmas toy drive for needy youngsters. The U.S. is home to approximately 3,000 greeting card publishers. The National Christmas Tree Association gives a Christmas tree to the President and first family every year. In Roman times, holiday gift giving was popular during Saturnalia, a winter solstice celebration. Approximately 33% of the holiday cards purchased each year contain a religious message. There are over 10,000 cut-your-own farms for Christmas trees in the United States. The poinsettia plant was brought into the United States from Mexico by Joel Poinsett in the early 1800's. The first person to bring a Christmas tree into a house may have been the 16th century German preacher, Martin Luther. The day after Christmas, December 26, is known as Boxing Day. It is also the holy day called The Feast of St. Stephen.